Stick to neutral shades for a day look. While a nighttime look may contain dark colors, shimmer and dramatic eyelashes, a day eyeshadow look generally sticks to toned-down neutrals. This makes a day eyeshadow look appropriate for just about any event, from work to school to a day in the park. You can create an easy day eyeshadow look with a few neutral shades and some good brushes. Apply a small amount of eye primer to each lid. Blend the primer out with the pad of your ring finger, making sure the entire eyelid is covered all the way to the brow bone. Primers help keep your eyeshadow in place all day and prevent creasing. Pick up a small amount of a light-colored shadow, such as champagne or taupe, with an eyeshadow brush. Dab the light color all over the entire eyelid. Press the eyeshadow in place instead of sweeping it across the lid. Use a fluffy blending brush to pick up a small amount of a slightly darker shade, like beige or light brown, and blend this color into your crease. Start at the outer corner of your eye and use circular sweeping motions to place the color into your crease. Be sure to leave space between your crease and your brow bone. Accentuate your eye by applying an even darker shade, like dark brown or plum, to the outer V area. Pick up a small amount of color with a pencil brush and create a V shape in the outer corner of your eye. While this step is optional for a day look, it creates a nice depth and shape. Apply a highlight color to the area just under your eyebrow. Choose a light shade, like cream, and sweep it just under your eyebrow arch. Use a clean, fluffy blending brush to blend all the colors together. Sweep the brush back and forth making sure to get rid of any harsh lines between the colors. Apply brown eyeliner right above your upper lash line and finish the look with a coat or two of black mascara. Boyers, Lindsay. "How to Do a Day Eyeshadow Look." 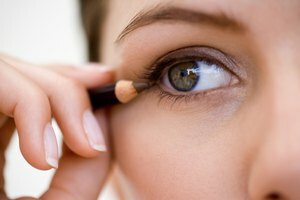 Synonym, https://classroom.synonym.com/day-eyeshadow-look-13636.html. Accessed 25 April 2019.